For your Bay Voyager Adventure Cruise, walk down to world famous Pier 39 waterfront and get ready for the adventure to begin! Travel further, faster and closer to the sights on the bay. Your cruise, narrated by your captain, will bring you up close with the history of San Francisco bay and waterfront. Outfitted with warm weather gear to keep you cozy and dry from the occasional sea spray, you'll cruise under the Golden Gate Bridge, along the Presidio waterfront, out to the Pacific Ocean, and up-close to meet the sea lions at pier 39 and so much more! 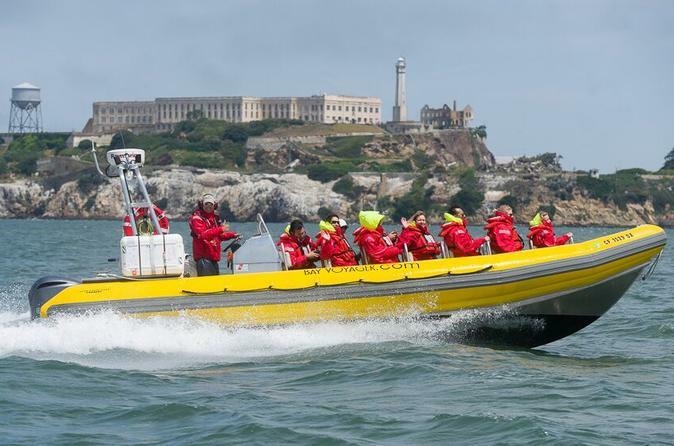 Your combo tour starts with the ferry ride to Alcatraz Island, departing from Pier 33. When you arrive, go inside and grab the provided audio headset for the self-guided 'Cellhouse' tour, which leads you through the former prison and illuminates what life was like as an inmate. See where prisoners such as Al Capone spent their time as you enter a cell, take a look at solitary confinement, walk in the cafeteria, and more. Plus, enjoy views of the bay, bridges, and San Francisco skyline. After your Alcatraz tour and return to Pier 33, take a 5-10 minute walk down the street to historic Pier 39. From there, head out on your 90-minute RIB cruise, which takes you past the Ferry Building, the Presidio, Alcatraz, and the waterfront. Cruise under the Golden Gate and Bay Bridge, and visit the beloved Pier 39 sea lions for an up-close look, no binoculars needed. With narration by your captain, you’ll learn something new about this historical area, and view the waterfront in a way that’s unlike any other experience on the bay. Other sights include a WWII Liberty Ship and Submarine, Fort Point, AT&T Park (during baseball games), the 1898-built Ferry Building, and Coit Tower. This small-group tour is limited to 12 people, ensuring a more personalized experience.